This street photo posted by Werben und Verkaufen Magazin on Instagram made me laugh. I m a massive fan of the BSR (Berliner Cleaning Facilities) advertising style. Since a few years all bins and cleaning vehicles in the city are covered with funny slogans and phrases that really make you feel connected and sympathetic with the company – and even the rubbish bins – which seem to come alive because of that. And this one is definitely the most inventive and stylish yet. Looks like it’s a clever PR gag for the Berlinale – the city’s prestigious annual movie festival. 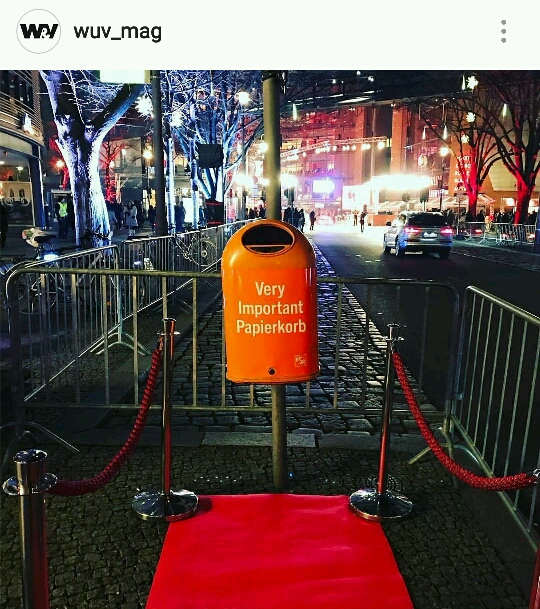 This entry was posted in Berlin, bins, BSR, funny, photography, street art, street photography and tagged advertising, Berlin, Berlinale, bins, BSR, clever, funny. Bookmark the permalink.